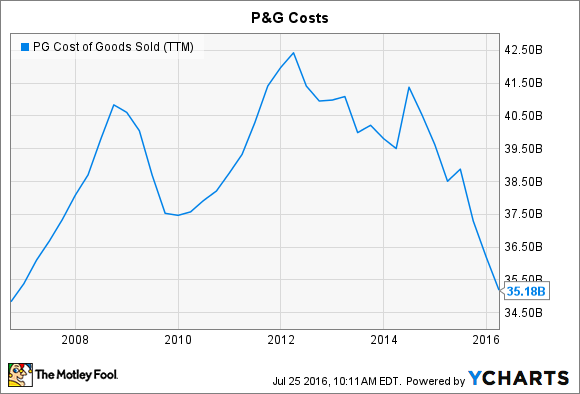 Will Procter & Gamble Co. Disappoint Investors Next Week? A lot is riding on the consumer-goods titan's earnings report next Tuesday. Expectations are low heading into Procter & Gamble's (NYSE:PG) quarterly earnings report next week. Revenue and profit are both projected to sink as the consumer-goods giant struggles with weak global demand and unfavorable currency moves. Worse yet, it's likely that P&G will show more market-share losses to rivals like Unilever (NYSE:UL). On the other hand, profitability should march higher as the company's initiative to transform its portfolio starts to take hold. Here are a few key trends investors should watch for in P&G's announcement on Aug. 2. Don't expect to see especially strong organic sales gains. Sure, Unilever just posted a 5% pop on that key metric. But the company also warned that global growth took another step lower as consumer demand fell in both emerging and developed markets. It's possible the industry slump will delay the growth rebound that P&G investors have been waiting a long time to see. Sales ticked up by just 1% in the first quarter after rising by 2% in the prior quarter. In fact, P&G hasn't achieved better-than-2% organic growth in nearly two years. Quarterly organic growth. Data source: P&G financial filings. Investors will want to pay close attention to P&G's sales volume. Volume has declined through most of the fiscal year, leaving price increases as the leading force behind organic growth. Unilever, in contrast, has been posting a healthy mix of volume and pricing growth all year. To get back to market-share gains, P&G will need to show the same balanced success at raising prices and moving more of its products into consumers' homes. Consensus estimates call for P&G to post a brutal 20% profit drop to $0.74 per share. However, the company's results are being pinched by a few major, but short-term, challenges. Moves in currency exchange rate are on track to cleave $0.35 per share, or about 9 percentage points from earnings growth this year. P&G's brand-shedding process, whereby it is removing roughly 100 underperforming product lines from its portfolio, also promises to hurt results in fiscal 2016. Cost of goods sold expenses are at a multiyear low. PG Cost of Goods Sold (TTM) data by YCharts. Underlying profit growth should be strong, though, as the company continues to slice billions of dollars out of its expense structure. P&G's core operating margin rose by 3 percentage points last quarter, and investors should look for a similar-sized bump this week. P&G has a potential advantage over Unilever in that it is taking a more aggressive approach to cutting costs. Management is trimming budgets across the operations, but they're also getting rid of low-margin brands. The resulting company should have a 10% lower sales base, yet is likely to enjoy stronger, and faster-growing, profitability. Those efficiency gains will show up most clearly in P&G's cash flow figures. The company is on pace to turn more than 100% of its net earnings into free cash this year -- or nearly $11 billion. Unfortunately for income investors, that success still leaves P&G's payout ratio unusually high at above 70% of earnings this year. As a result, the next dividend boost will likely be closer to the modest 1% uptick shareholders recently endured. Cash flow growth does give management flexibility to boost stock buybacks at will, though, and that's why repurchases will figure prominently in P&G's bold plan to return $18 billion a year to shareholders through 2019. Finally, investors will get their first look at P&G's official growth projections for the coming year. Given the shrinking industry that Unilever just described, that's likely to be close to last year's soft 2% uptick in organic sales. CEO David Taylor and his team are likely to target serious profit gains, though, as currency issues finally start settling down.